Nothing new finished for this week’s post, so back into the archives we go! 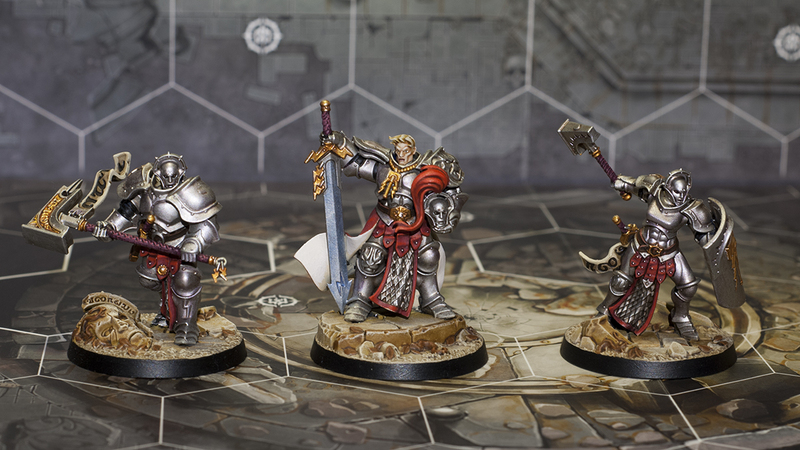 This time I’m presenting the Steelheart’s Champions from Shadespire. I’ve only got one good picture of the group, as I hadn’t figured out my photo setup when I originally finished these models. Later when I took the above photo, for some reason I didn’t bother taking a shot of their backs. Not a big deal though, as apart from the leader they are not really that interesting from behind. I showed Severin in a previous post, but here’s the rear view again for convenience. While I started the Revelators Tactical Squad before these guys, they were actually the first group of minis that I finished after the very experimental Chaos Cultists. Of course, there was plenty of new techniques to try out with these guys as well, such as painting faces, a big cape and using washes and glazes for tinting steel. The sword and the cape were not too successful, but I labeled them good enough. Overall, I’m still very happy with the models. As I’ve mentioned before, the color scheme is called “Silverlions”, and was nicked from Thilo Engels, aka Banzai1000. Getting these models was actually pretty much a happy accident. When I got back to the hobby I though it would be just 40k, as that’s what I had been doing back in my teenage years and WHFB had never been too interesting to me. But when Shadespire came out I was really awed by the models and was also intriqued by the game. Shortly after the release I happened to see someone selling an unused copy for half-price, and that was too good of a deal to pass up. I thought that I’d get it just to paint the models, but it turned out that the game is brilliant as well, which was a nice bonus! I don’t say it often enough, so I think “awesome” fits the bill here! Very nice indeed!